Houston is a city known for its carefree traffic, friendly drivers, crystal clear beaches, and white sands. Ok… maybe not. 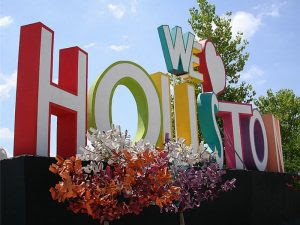 But artist David Adickes has used his talents with sculpture to make Houston known for a few good things. On any given day, one may drive through Huntsville and catch a glimpse of a large, 67-foot tall steel and concrete sculpture of Sam Houston. Or, one may drive by the Lyric Centre in downtown Houston to catch sight of a 36-foot concrete cellist. Both of these works are Adickes’ successful attempts to bring public art to Houston. And to this we say… why not? Houston is a city covered by concrete buildings and metal cars. Art is a form of expression, adding interest and creativity to a very logic-filled city. One can’t help but stop on the side of the road to snap pictures of art and sculptures, if we ever see them! Culture Map reports that the 28 foot tall sculpture will no longer be located on Adickes’ property, but instead become a part of the Bayou City Skyline. Mayor Annise Parker is said to also be at a formal dedication ceremony this Friday July 12th. The 3D letters are fun and a new exciting part of this city. Good job David Adickes! Smash Design gives you a thumbs up.